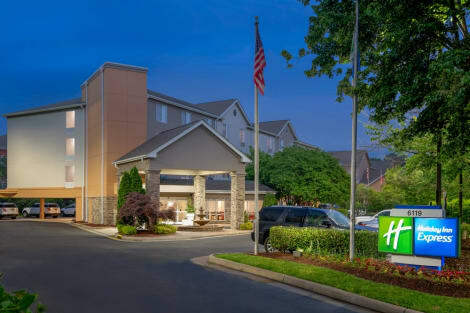 When you stay at Chapel Hill University Inn in Chapel Hill, you'll be connected to a shopping center, within a 15-minute drive of Franklin Street and University of North Carolina. This hotel is 8.7 mi (14.1 km) from Duke University and 7.6 mi (12.2 km) from Cameron Indoor Stadium. Make yourself at home in one of the 119 air-conditioned rooms featuring refrigerators and microwaves. LCD televisions with digital programming provide entertainment, while complimentary wireless Internet access keeps you connected. Private bathrooms with shower/tub combinations feature complimentary toiletries and hair dryers. Conveniences include desks and complimentary weekday newspapers, as well as phones with free local calls. Featured amenities include a business center, complimentary newspapers in the lobby, and dry cleaning/laundry services. Planning an event in Chapel Hill? This hotel has facilities measuring 1400 square feet (130 square meters), including conference space. Free self parking is available onsite. Make yourself at home in one of the 108 air-conditioned rooms featuring kitchens with refrigerators and stovetops. Your bed comes with premium bedding, and all rooms are furnished with sofa beds. Complimentary wired and wireless Internet access keeps you connected, and cable programming provides entertainment. Conveniences include phones, as well as desks and complimentary newspapers. Featured amenities include a 24-hour business center, express check-in, and express check-out. Planning an event in Chapel Hill? This hotel has facilities measuring 2163 square feet (201 square meters), including conference space. Free self parking is available onsite. Make yourself at home in one of the 98 air-conditioned rooms featuring refrigerators and LCD televisions. Your bed comes with premium bedding, and all rooms are furnished with sofa beds. Complimentary wired and wireless Internet access keeps you connected, and cable programming provides entertainment. Bathrooms have complimentary toiletries and hair dryers. Make yourself at home in one of the 79 air-conditioned rooms featuring refrigerators. Complimentary wired and wireless Internet access keeps you connected, and satellite programming provides entertainment. Private bathrooms with shower/tub combinations feature complimentary toiletries and hair dryers. Conveniences include safes and desks, as well as phones with free local calls. Make yourself at home in one of the 67 air-conditioned rooms featuring refrigerators and LCD televisions. Your bed comes with down comforters and Egyptian cotton sheets, and all rooms are furnished with sofa beds. Wired and wireless Internet access is complimentary, while iPod docking stations and premium TV channels are also offered to provide entertainment. Private bathrooms with showers feature complimentary toiletries and hair dryers. lastminute.com has a fantastic range of hotels in Chapel Hill, with everything from cheap hotels to luxurious five star accommodation available. We like to live up to our last minute name so remember you can book any one of our excellent Chapel Hill hotels up until midnight and stay the same night.